I always get terribly excited about discovering a new vegetable, particularly a vegetable that I can roast. Roasted veggies are one of my food addictions. They are also the most reliable trick for converting picky eaters into lovers of turnips, cauliflower, beets, and other challenging veggies. So, when Stephen introduced us to rutabaga (a larger version of turnip), I spent the whole afternoon at work day dreaming about rutabaga fries. These are “fries” only in the name, not in the taste. 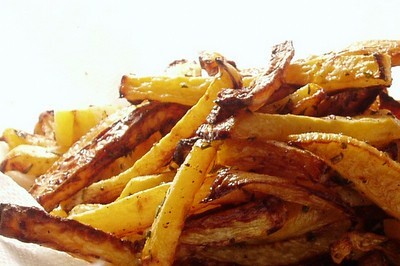 They are roasted, not deep fried, and much softer and sweeter than potato fries. You could really just cut rutabaga into large dice and roast it, but cutting it into French fry shapes exposes more surface area to the cookie sheet and makes more of those caramelized, mmm-so-good surfaces. This recipe also makes killer sweet potato fries. If using sweet potatoes, don’t peel them, just wash well and dry with a paper towel. Preheat the oven to 475F and set a rack to the lower third of the oven. Mix rutabaga with olive oil, garlic, herbs, salt, and pepper to taste. Put a large cookie sheet into the lower third of the oven for 5 minutes to preheat. Add 2 Tbsp canola oil to the cookie sheet and return it to the oven for 2 minutes. Put rutabaga fries onto the hot cookie sheet; they should sizzle. Spread them out with tongs in one layer. Roast 15 minutes. Stir, and roast until tender and browned, 10-15 minutes. Remove to a bowl lined with paper towel to absorb the oil. Sprinkle with salt and serve. Actually, cayenne would be wonderful. I did use some along with garlic and herbs and it was great. But since I was writing this recipe around 11:30 last night, I forgot to mention cayenne. If you can believe it, I have NEVER even tried a rutabaga. But you've made it sound delicious and easy. And I love any vegetable with rosemary. I shall be sure to try this one! This looks great! I'm inspired. I've been keeping my eye out for the rutabagas but haven't seen them yet. Hello Helen, Just wanted to let you know that I made these again tonight. :) This time I was looking for an alternative to bread to go with the roasted garlic soup I was making, and I thought that these would be an interesting pairing.... And it was so good! I roasted them with just cayenne pepper and s & p, and then kind of dipped some of them in the garlic soup, and so the sweetness of the roasted garlic was boosted at the end by a kick of the sweet and spicy rutabagas. The garlic soup with rutabaga fries sounds SO GOOD! You wouldn't happen to have a recipe for the garlic soup, would you?